This Advent our theme for worship is “The Word became flesh and dwelt among us.” Join us on Sunday mornings at 10:30 AM for an experience of the Word made flesh. We’re also happy to share a series of advent devotions for you to explore during the week. ELCA Presiding Bishop Eaton will lead off the devotions with a reflection on God among us during the “in between” times. Other devotions have been prepared by the bishops of The Evangelical Church in Canada, The Anglican Church of Canada and The Episcopal Church. 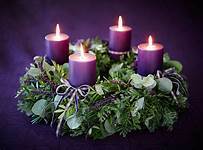 Enjoy an Advent Devotion for each week here.